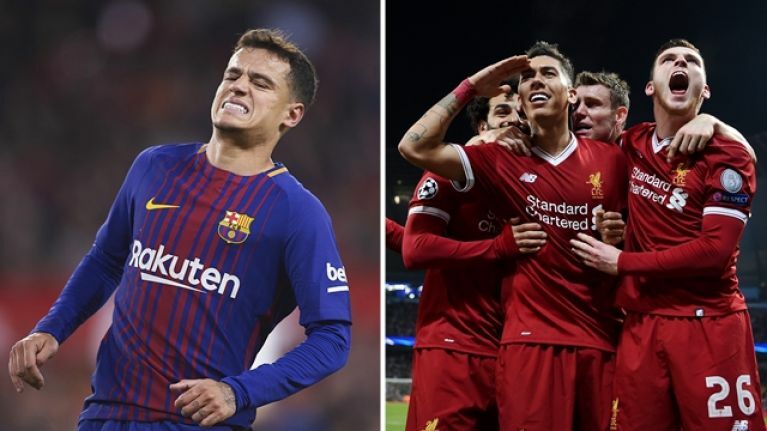 Tuesday's Champions League action was full of drama. Liverpool booked their place in the Champions League semi-finals with a 2-1 victory over Manchester City the Etihad, winning the tie 5-1. While, over in Rome, Barcelona suffered an incredible defeat. The Catalan club took a 4-1 lead into the second-leg at the Stadio Olimpico. However, Roma completed an amazing comeback, winning 3-0 on the night against Lionel Messi, Luis Suarez and a shell-shocked Barca side. The Serie A side went through on away goals. Philippe Coutinho left Liverpool for Barcelona back in January in a transfer worth £142m. The Brazilian midfielder, who appeared for Liverpool in the competition earlier this season, hasn't been eligible for Barca's Champions League games this season. Yet, Reds fans took joy from seeing Barcelona exit the tournament. Now that Barca are out, we're sure Coutinho will be rooting for Liverpool. If things had have worked out differently, he could have been part of the first Liverpool team to reach the last four of the Champions League in 10 years.